David Cameron's hopes of getting a reform deal on Friday look in doubt as haggling continues at the EU summit. Leaders have finally sat down together for dinner after several member states opposed plans to curb migrant benefits and change EU regulations. The prime minster had planned to return to the UK to fire the starting gun on an EU referendum campaign on Friday. The BBC understands Justice Secretary Michael Gove will campaign in the referendum for Britain to leave the EU. Mr Cameron sounded cautiously optimistic about his prospects of a deal on Friday morning, saying there had been "some progress" in marathon all-night talks, which broke up at 05:30 GMT. But stumbling blocks still remain after a day of one-to-one meetings and there is speculation talks will continue into Saturday. The original aim had been to conclude the deal at an "English breakfast" meeting on Friday, which became an "English brunch", then an "English lunch" and eventually an "English dinner". Mr Cameron's plan had been to head back to London, with a deal in his pocket, for an emergency cabinet meeting at which he would commit the government to campaign for Britain to stay in a reformed EU. That would trigger the start of the referendum campaign and allow ministers who want Britain to leave the EU to speak out. But Mr Cameron has now said there will not be a cabinet meeting on Friday although he added "one will be held if and when a deal is done". Downing Street had said the prime minister was "likely to have a number of further bilaterals including with the Danish PM, the Czech PM and the Dutch PM" before dinner. A senior EU official said summit host Donald Tusk, the European Council president, believed there was a "chance" of a deal over dinner but many issues remained to be resolved. The BBC's Europe correspondent Chris Morris said there was confidence "in the background" that a deal could be done on Friday or Saturday. EU leaders did not want to leave Brussels without a deal and face having to return for another summit, he added. There are signs that some of the stark differences expressed on Thursday, at the start of the two-day summit, are starting to narrow. Poland's Europe minister Konrad Szymanski said a deal was "close", telling reporters: "We managed to have a compromise on many, many issues... but we still need more clarification, more guarantees to get the compromise which would be satisfactory for both sides. There's still some way to go, we need some hours." Poland is among four Central European countries resisting a British demand for an "emergency brake" on in-work benefits for migrant workers to be in place for as long as 13 years. France and Austria both voiced concern that Mr Cameron's demand for safeguards for non-eurozone countries, aimed at protecting the City of London from new financial regulations, might impede the development of the single currency. President Francois Hollande said France wanted "a financial regulation system which is valid in all parts of Europe" with no "right of veto" for individual countries. Austrian Chancellor Werner Faymann said the UK must not be allowed to exercise "a blockade against genuine banking union or other deepening of the eurozone". One UK official said: "Nothing is agreed until everything is agreed... what matters is that we get the right deal, it doesn't matter how long it takes." Changing treaties to alter the principle of "ever closer" union. Mr Cameron is thought to have rejected calls from the Central European nations, represented in the overnight talks by Czech Prime Minister Bohuslav Sobotka, for cuts in child benefit for offspring living overseas to be imposed only on new migrants. Belgium - backed by France - proposed that the summit conclusions should state that any deal agreed this week is final and the EU will not make an improved offer if Britain votes to leave. The move is designed to kill off the idea, backed by some Eurosceptics, that a Leave vote would give the UK leverage to extract further concessions from the EU before a second poll. Ukip leader Nigel Farage said he expected Mr Cameron to come back with a deal from Brussels, as the other leaders would recognise how "embarrassing" it would be for him to return empty-handed. But he added: "He hasn't asked for us to get back supremacy for our Parliament, he hasn't asked for us to control our own borders, he hasn't asked to reduce the vast daily fees we pay. "We will be allowed - after he has come here like Oliver Twist and begged for concessions - to control migrant benefits for up to four years. I find the whole thing as a British person pretty shameful." Labour leader Jeremy Corbyn said his party would be campaigning for Britain to remain in the EU - but he branded David Cameron's renegotiations "a theatrical sideshow, designed to appease his opponents within the Conservative Party". If David Cameron gets a deal, he will return to the UK and hold an emergency cabinet meeting - possibly on Saturday - to reach an agreed position on remaining in the EU. At this point, ministers who want Britain out of the EU will be allowed to speak out. Still seen as the most likely date of a UK referendum if Mr Cameron gets a deal in February (or the March EU summit) but he has until the end of 2017 to hold one. 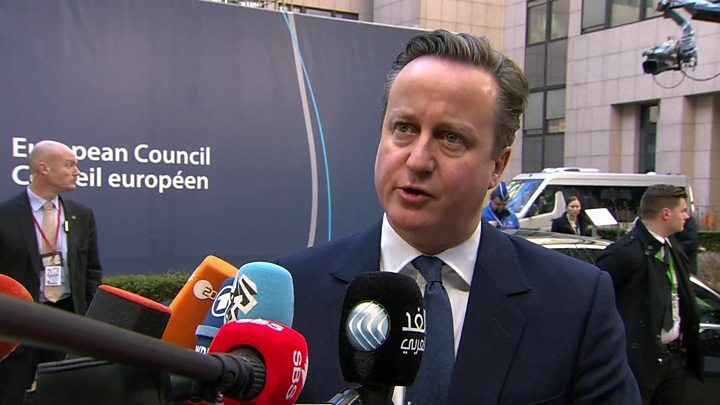 EU summit: How did David Cameron end up here? Is David Cameron seeking an EU reform too far? Video EU-UK: Why the love-hate relationship?